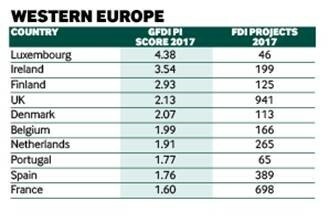 A study by fDi Intelligence reveals which countries outperform their size when it comes to generating greenfield foreign direct investment (FDI). Greenfield FDI data used in the index is derived from fDi Markets, and excludes retail investments. The 2017 index had 92 countries. To be included in the index, a country must have received at least 10 greenfield FDI projects in 2017. Luxembourg tops the western European regional index. The country received a record number of greenfield FDI projects in 2017, which positively impacted its index score, beating Ireland, which was regional leader in 2016. Just under 40% of all greenfield FDI projects into Luxembourg in 2017 were in the financial service sector.